I kindly received The Accident in exchange of an honest review by the publisher via NetGalley. Everyone who is involved in the book blogger community knows that book blogger have a lot of power. Either it's about promoting an author, new realeses or introducing and recommend books to each other. I came across The Accident in one of Laura's (She Loves To Read) mothly book hauls. As you all know, I'm a passionately lover of romance and chick lit books. I rarly change the genre of the books I read but somehow The Accident has drawn my interst and it hopped on my wishlist. When I spotted The Accident on NetGalley I jumped at the chance and reqested it. I was very surprised when I received the email I was accepted for this title. Many months later, I finally picked it up and stept out of my comfort zone. Fifteen year old Charlotte is lying in a hospital bed in a coma. She stepped out in front of a bus. Her mother Sue is convinced that this was not an accident. Sue thinks that Charlotte tried to take her own life. She has a reason to think that because she read her daughter's diary, she read the entry that says "keeping this secret is killing me". Sue is determined to find out the truth, to find out what this secret is. She's suspicious of everyone - of her husband, of Charlotte's boyfriend, her best friend, her teachers, she knows that someone knows something but nobody is talking. The book was told through chapters in the present day and then entries from a diary Sue kept in the early nineties. This is Sue's past story, written in her own words and tell the story of her relationship with James, her ex-boyfriend. It is these diary entries that explain to the reader just why Sue acts as she does today. Sue was broken by James, broken almost beyond repair, and although she has managed to make a new life, it's clear that inside her there are still some pieces that haven't yet healed. Will Sue find out the reason her daughter stept in front of the bus? Go and get your copy now to find out! Where do I begin to share my thoughts on this one ...? It never happend that I am lost of words whilst writing a review. This book left me speechless. It was one of the best books I've read in 2014. I raced through this book in two days. I just couldn't put it down. I was gripped from the start to the very end. C.L. Taylor has created a cleverly structured storyline with a cast of such convincing characters and the intrigue and plot twists will really mess with your mind. The story builds, the pace quickens and the suspense is quite electrifying. My heart was beating fast, I hold my breath and nearly forgot how to breath. 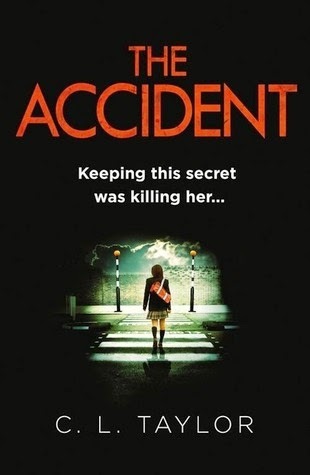 Incredibly convincing, The Accident is a gripping read that will stay in my head for a long time. The Accident is waiting to blow your mind - go for it! If you are a fan of psychological thrillers then I can highly recommend this one. I certainly will be eagerly awaiting this author’s next book. The Lie is my most anticipated book of 2015. Wow, what a different take on the psychological thriller. It is definitely out of my comfort zone as well! Thanks for your thoughts on this one... I'm tempted to pick it up!